Two people, including a senior Palestinian militant leader, have been killed in an Israeli air strike in Gaza, according to Israeli and Palestinian sources. 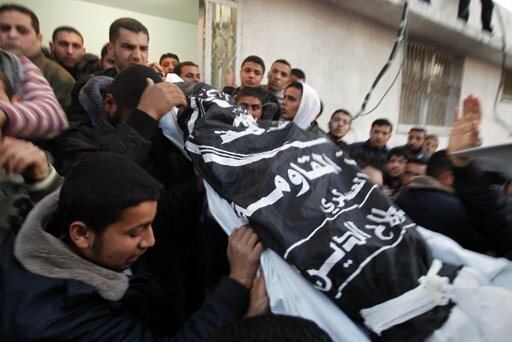 Zohair al-Qaisi, secretary general of the Popular Resistance Committees (PRC), was targeted because he was planning an attack, the Israelis said. The Israeli military later confirmed a second air strike killed two more people it says were preparing to fire rockets into Israel. The PRC, which represents a number of armed factions aligned with Hamas, has carried out several rocket and grenade attacks against Israel. Palestinian sources said the second militant was Mahmoud Hanani, who was released from an Israeli prison five years ago and sent to Gaza. Earlier sources had wrongly said he was among those released under a prisoner exchange deal which led to the release of the captured soldier Gilad Shalit. Medical sources say a third man was seriously injured in the attack, near Gaza City. Witnesses say Israeli drones were heard in the area shortly before the car burst into flames, AP reports. The air-strike came a few hours after two mortar shells fired from Gaza landed in Israel without causing injury. An Israeli military spokesman said Zohair al-Qaisi was behind a series of gun and bomb attacks near Israel’s border with Egypt last year, in which eight Israelis were killed. Ten of the attackers and five Egyptian soldiers also died. A spokesman for the PRC in Gaza vowed to take revenge on Israel for the attack. The PRC is a coalition of armed factions in Gaza that is loyal to Hamas but sometimes operates separately. The former head of the PRC, Kamal al-Nairab, and its military chief were killed in a similar Israeli attack last year.